hey jeremy, if you have the data available for fubar.com could you send it to me? my internal stats max out at 1 hour session times, and 25-30% of all our visitors have been in that 1 hour+ bracket since it launched… i’m curious if comscore thinks it’s under 40 minutes or if my stats are busted. cheers! however, seems like according to these stats there isn’t much separating the top 5… they’re all withing 10-20% of each other. that’s a lot less substantial than the previous rank ordering due to PV’s, where the variance was up to 50% (and in fact, placed Gaia last in the top 5 instead of 1st). so i would say that while PV’s isn’t massively uncorrelated with time-on-site, the comparative conclusions one might draw using PV #’s instead of time-on-site #’s is dramatically different… were i to compare Gaia & Orkut by those 2 measures, i’d have a vastly different conclusions. Q: also would be interesting to see if there was any change in Facebook time-on-site due to introduction of Platform + Apps, or whether it didn’t make much of a difference. Interesting. Ezboard is a traditional message board, though, no? Is that still technically a social network? Not that it’s relevant to this particular post, just curious on a side note. 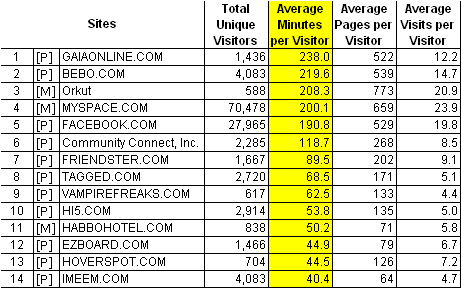 c) From Columns 5 & 6, the average pageview per visit (C5/C6). During a visit, a visitor, on an average, spent 11 minutes and viewed 26.5 pages at the rate of 27 seconds per page . Doesn’t this also mean that AJAX/Flash UIs don’t seem to increase (or maybe even hurt) user engagement? With how young most of these sites are, the legacy issues of page construction shouldn’t be driving the issue. Is it possible for me to know how many MySpace users are form the United States? Do you have that number? Im writing my honor program thesis at the University of Puerto Rico, and I need the aproximate number of US MySpace users. Yes, I think using the actual time a visitors spends makes a lot of sense. I am using the “minutes” for quiet some time to give accurate and quality data back to my clients.